Clark Bakker, a New York LEGO enthusiast recently notified me of a very very rare LEGO book that he had gotten a copy of. is very low, and may be the rarest of all LEGO paper items. 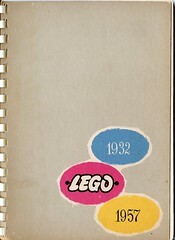 My favorite pages are 32-33... which show the LEGO products that were soon discontinued (page 32, by 1960), as well as the newer LEGO System of Play products that had recently been introduced (page 33, in 1955) and would be the future direction of the company. Yes, this is a great historical find, indeed!